BRIOIS, the family-owned company founded in 1935, is a benchmark player in the molding, packaging and distribution of butter. From small-scale dairies to wholesalers, super/hypermarkets, out-of-home catering and agri-food industries, BRIOIS supports its customers in the manufacture and customization of products as well as their subsequent marketing. Over the years, BRIOIS has fine-tuned its methods to improve its range of butters and the quality of its products. Upgrading of processes and the development of its in-house laboratory mean that it only markets quality, IFS-certified butters. The stringent approach adopted by BRIOIS allows it to distribute 100% natural products in France and internationally. The company's commitment to customer satisfaction has inspired it to come up with diversified recipes and innovative packaging, particularly with its easy-opening tubs of long-life butter (best-before dates of 1 year and 2 years). 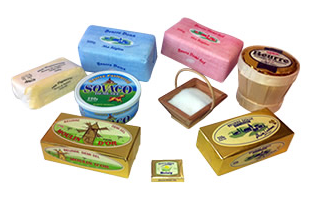 SOVACO tub butter has been part of the heritage of REUNION, MARTINIQUE, GUADELOUPE and FRENCH GUIANA since 1952. We put our heart and soul into producing butter which is a firm favorite with all generations. Discover our broad range: 82% fat (traditional butter) and organic butter.